Richard L. Dugger II, and his wife, Tammy purchased the Martin Funeral Home in Elk City on December 31, 2013. To honor the Martin Family and their over eighty-eight years of service to the communities of Western Oklahoma, the name will not be changed but rather altered to include our family name along with theirs. The funeral home was renamed Martin-Dugger Funeral Home. Richard L. Dugger II, CFSP is a native of Elk City, Oklahoma. He is the son of Richard L. Dugger, and the late Patricia Ruth (Binyon) Dugger. Richard is a 1982 graduate of Elk City High School and 1988 graduate of Central State University. He is a licensed funeral director and embalmer in Oklahoma and Texas; he also is a licensed life insurance agent in Oklahoma and Texas. He and Tammy have four children, Zach Rowland, Radek Dugger, Lex Dugger and Elizabeth Dugger all of Elk City. Richard has over thirty years’ experience in the funeral business. His career began working for his uncle Eddie Binyon in Chickasha, Oklahoma in 1984 at the age of nineteen and later attended and graduated from the school of mortuary science at the Central State University. He then worked in corporate funeral service working his way up from a Funeral Director/Embalmer to Vice President of Operations and Acquisitions for a Funeral Home Corporation based in Houston, Texas. He was a principal partner and Senior Vice President of Operations in a funeral service company located in Fort Worth, Texas until returning to Oklahoma to purchase his own funeral homes in 2002. In 2002 Richard, bought Brown Funeral Home with locations in Perry, Garber and Billings, Oklahoma. He owned and operated these funeral homes until the completion of the sale of Martin Funeral Home in Elk City so he could return home. Tammy was born in Oklahoma City, Oklahoma and was the second of three children born to Peggy L. and the late Hayden G. Watson. She graduated from Chandler High School in 1985 and went on to receive a BA in Science from the University of Central Oklahoma in 1995. Tammy served in the US Army reserves for eight years and attained the rank of sergeant. Tammy has worked in the funeral industry for over ten years and his currently working on her degree in funeral service. She has also worked in the insurance industry as an agent and adjuster for over ten years. Richard L. Dugger II, CFSP of Elk City, OK, was awarded the designation of Certified Funeral Service Practitioner (CFSP), by the Academy of Professional Funeral Service Practice (APFSP). A number of professions grant special recognition to members upon completion of specified academic and professional programs and “CFSP” is funeral service’s national individual recognition. The Academy of Professional Funeral Service Practice, since its 1976 founding, has had as its goals: (1) to recognize those practitioners who have voluntarily entered into a program of personal and professional growth, (2) to raise and improve the standards of funeral service and (3) to encourage practitioners to make continuing education a life-long process in their own self-interest, the interest of the families they serve, and the community in which they serve. Governor Brad Henry re-appointed Richard to the Oklahoma Funeral Board on October 23, 2009 to serve until his term expires July 1, 2014. His original appointment by Governor Brad Henry expired July 1, 2009. He has served the board as its President for two terms. Richard is a member and past president of the Oklahoma Funeral Directors Association. He is a member of the National Funeral Directors and serves on the resources advisory group committee, membership committee and governance committee. He also serves on the University of Central Oklahoma Funeral Service Advisory board and is a life member of the University of Central Oklahoma Alumni Association. 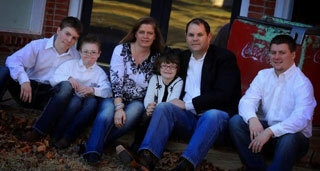 As a family we are grateful to the Martin Family for honoring our family by entrusting us with their families business. It is an honor for us to receive the trust, tradition and family heritage of over eighty-eight years of services to the families of Western Oklahoma. It is our desire to continue to serve the families and communities in a compassionate, professional and caring way that they have grown accustomed to. Please feel free to call or come by with any question or concerns or just have a cup of coffee and get caught up or just say “Hello”.